It’s only appropriate that in our third quarter commentary, we focus on the number three. Since our last update, ‘3’ is appearing more frequently and is shifting things in our world: Nightly low temperatures around Boulder have sunk into the 30’s, gas prices hover around $3.00 and the 10-year Treasury bond is squarely above 3% – a level that it has had trouble breaking through over the past 7 years. We’ve all heard people say that “things happen in 3s.” It has also been associated with time: past, present, future; and with luck, “third time is a charm.” But in this financial market context the number three has stirred up nothing but consternation. Before continuing, we’d like to make clear that we don’t anticipate any type of market collapse or pullback anywhere near the last recession. We do, however, see many reasons why the market could pause here to adjust to new dynamics at play. 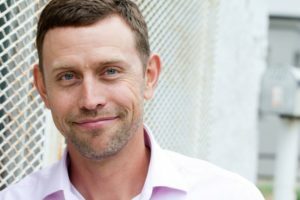 Since the last recession, the playbook has been how to get yield in a no-yield world and how to get growth in a low-growth world. This has now shifted. Economic growth has picked up. The latest U.S. GDP numbers indicate the economy grew an annualized rate of 4.2%, where it had been averaging just 2%. As mentioned, yields have really picked up. The yield on the 10-year Treasury bond now stands at 3.23%. Investors are also getting over 2% in most money market funds again. Heck, a 5-year CD is yielding 3.40%! Savers, investors and pension funds looking for yield no longer need to get creative or go out on the risk spectrum (i.e. buying dividend-paying stocks or high yield bonds) to beat inflation. Speaking of inflation, with $3.00 gas, higher Chinese import costs (due to tariffs) and labor costs rising (Amazon just raised wages to $15/hr to attract warehouse workers), we’d expect inflation to start picking up. It has been flatlining for years around 2%. These price pressures have caused the Fed to get much more hawkish. Chairman Powell has mentioned that they are not near ‘neutral’ rates yet (neither stimulative nor restrictive) and that they may go past neutral to nip inflation in the bud. Even traditional stock investors now have safer alternatives. 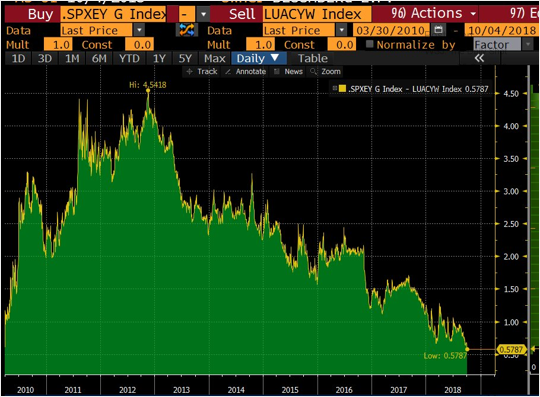 The spread between the earnings yield on the S&P 500 (inverse of the price/earnings ratio) and investment grade corporate bond yields is at multi-year lows. Per the chart below, stock earnings yields were 4.50% above corporate bond yields in 2012, as opposed to 0.58% today. All this brings me back to where we feel the biggest cracks in the market may lie. Since 2008, money has been relatively cheap and easy to obtain. Because of this, both consumers and corporations have been on a borrowing binge. With interest rates rising and financial conditions tightening, this may cause some pain in select areas of the debt market. 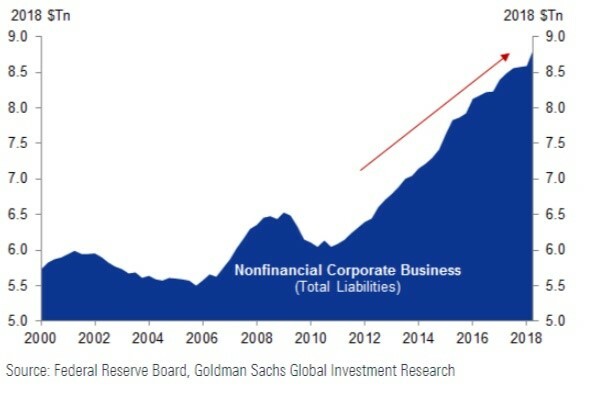 Not only have companies been borrowing to fund growth, but they have been borrowing to buy back their own shares; to keep the song playing in the earnings-musical-chairs game. 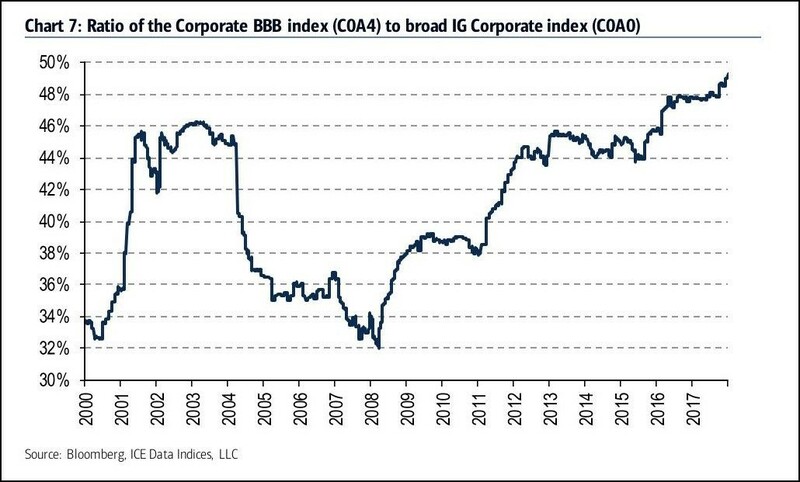 Not surprisingly, it’s been the lowest-rated of the investment grade corporations that have been head down at the trough. Most of this recent borrowing has been done by corporations reporting record high-profit margins and earnings. With the tendency of banks to straight-line projections based upon the last few years, it won’t take much in the way of an earnings slowdown (possibly brought on by the increased costs mentioned above) for vulnerable, leveraged firms to struggle. 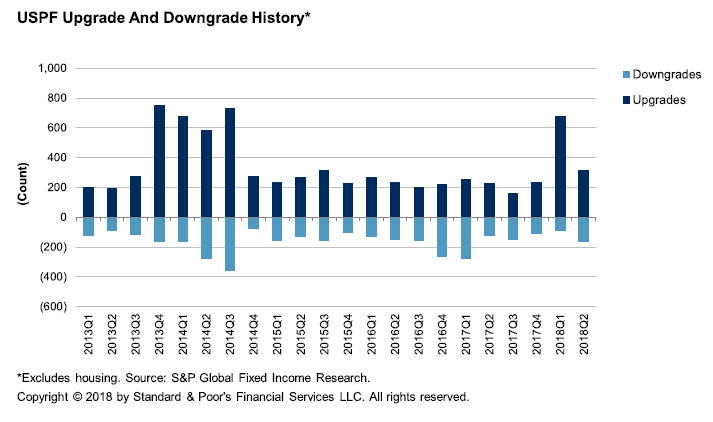 As the chart above illustrates, defaults have remained low despite record levels of debt. A very accommodative Fed and the willingness for banks and investors to lend kept the default rate low from 2013 through today (excluding a blip in 2016/17 that was isolated to the energy industry). 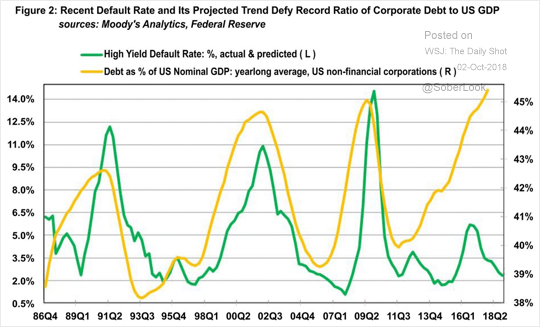 By delaying the inevitable, will the default cycle be worse this time around? Only time will tell. What are we doing to avoid this potential pitfall? Currently, BSW does not have any exposure to the corporate high yield market. We are using the rise in market interest rates to buy more quality, core municipal bonds at higher yields. Higher yields are on offer without any adverse changes in either muni credit quality or the amount of debt outstanding. We don’t expect municipalities to succumb to the pressures of higher rates and tighter money conditions because they have been disciplined and relatively frugal for years. 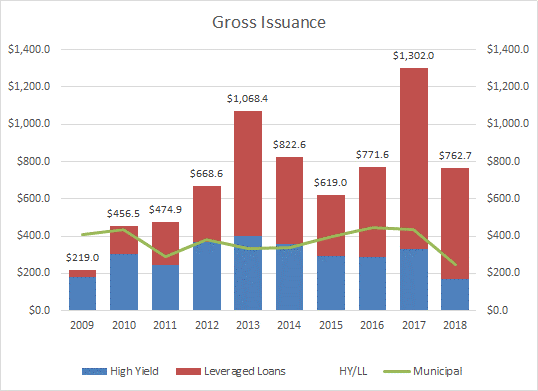 Municipalities have been paying down their debt and lowering their borrowing costs in general. Furthermore, state and local sources of tax revenue have been trending higher due to increased consumer spending and rising real estate values. Per the Federal Reserve Financial Accounts report Z.1 (a finance nerd’s Sports Illustrated), state and local debt contracted at an annual rate of 0.4% in the second quarter of 2018 after contracting at an annual rate of 2.9% in the first quarter. Meanwhile, non-financial business debt rose 4.6% in the second quarter. Along with buying munis at attractive yields, we also anticipate using any ripple effects within the stock market to add to our highest conviction positions. Again, we don’t expect any type of market rout because valuations do not appear to be at extreme levels. In fact, in areas like emerging markets valuations are now below historic norms and look very attractive. We have been waiting for years for yields to normalize. Contrary to the cautionary tone of the above, from our perspective, this is a positive development in general. It means the economy has found its own footing and has moved past the days of relying on government stimulus to support growth. 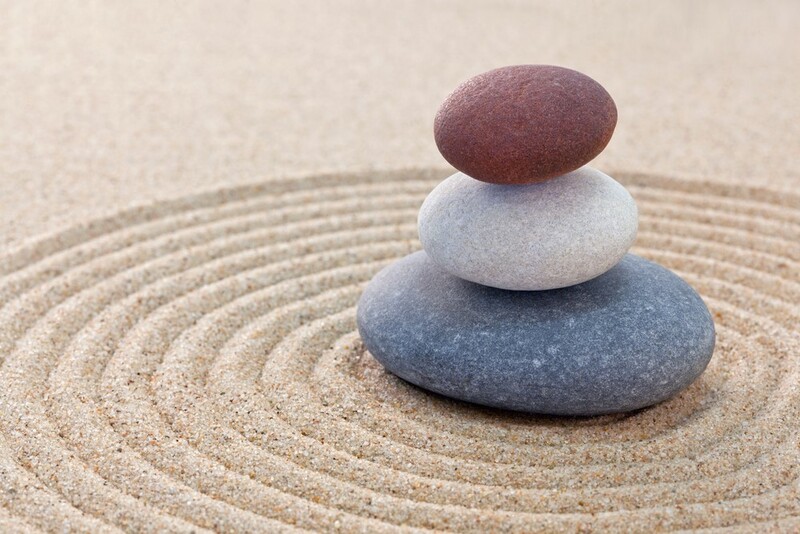 We believe most high-quality assets will weather any side effects without any long-term ramifications. It’s only the firms that were dependent upon (or abused) the previous easy money regime that are likely to finally be exposed. Making money while the music is still playing is important. Being in the market when the band starts up after a quick break is also vital. What enables us to do this is an emphasis on building asset allocations for clients that aim to achieve their financial goals – even accounting for the down years. Thanks for reading and please contact us if your financial situation, goals or risk tolerance have recently changed. The music comes and goes, but regardless, we want to make sure that BSW and our amazing clients are dancing the same jig!